Okay, I’m on a portrait jag, I too this portrait of Bud by putting a dog treat on the top of my bald head. He was looking for it, and then I growled like a dog and he tilted his head and his eyes widened. I hit the shutter. I know a hundred ways to make a dog like the camea. That’s how I get the best portraits of my dogs. What does a portrait show, anyway? I think it shows a lot. I try to keep perspective on my dogs. We all love our dogs and think them beautiful and adorable. I don’t think Bud is adorable, really, I think he’s so ugly in many ways that he is cute. Fate is a beautiful dog to me, her coloring eyes, classic head and shape. Red is beautiful in a dog-handsome kind of way also. Bud is not beautiful, he looks like Edward G. Robinson on a good day, and Winston Churchill most other days. Not bad comparisons, if you have to look like somebody. But he is beautiful to me, and I smile when I look at him. I do not go around showing photographs of him to people talking about how gorgeous he is. His face has great character. His eyes suggested intelligence and focus. He gives off the aura of great wisdom (a fallacy, I think.) Bud is a serious dog most of the time. He worships food and disgusting things to eat. Sometimes I see sadness in his eyes, but this is a projection, I know he had a rough time for most of his life, but I doubt he remembers much of that. He is too busy. I’m curious to know what others see in that face. I think I love him all the more because he us ugly, this is a fact that has seen too much in its young life. He is affectionate when he is not racing around, minding everybody else’s business. Bud has such an interesting face. 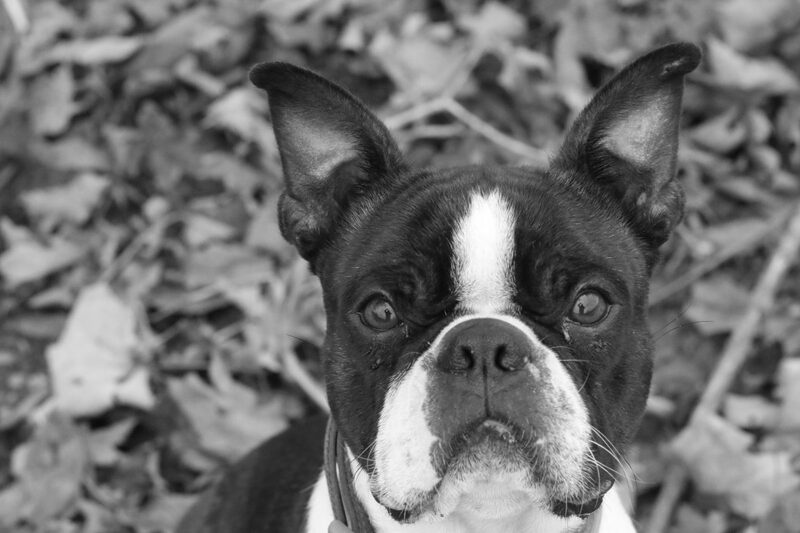 We are experiencing our first small dog, the Boston Terrier Rocky. Because they can have such cartoon-like looks and antics, I can see that some BT owners do a lot of coddling and infantilizing. Sometimes it’s hard not to, they can be so goofy. But in Bud –and in Rocky, too –I see a bit of soulfulness, and also a sense of the breed’s independent streak. This is a beautiful portrait. The stories about Bud I most love are the descriptions of his crawling onto you to nap. The way these sweet if rascally dogs derive comfort from physical connection is so darn endearing. Thanks for sharing the journey. Jon – you used a word for when two dogs have the same markings, like a Red and Bud and I can’t remember it. Can you help me out. I tried google with no luck. Thank you. Hi! I think the word might have been doppelgänger! it is interesting what a person defines as ugly..I don’t think Bud is ugly..he is a Boston, he is what he is..and as you said, he has intelligent eyes, he has focus, at least when you put a treat on your head.lol. He has classic features and lovely markings..I rarely look at a dog and think it is ugly..I do however look at dogs and think some are beautiful, Border Collies in particular, is that because they are my breed of choice, most probably..we are all biased to those we love. I LOVE his smushy face! It’s the kind of face that draws you in and makes you want to pet him or pick him up. I love that I can see you in his eyes, taking the picture. That is very cool. Your portraits of people make me want to know the person – they draw me in.